Did you have a New Years resolution to get fit? Here's a little bit of help. 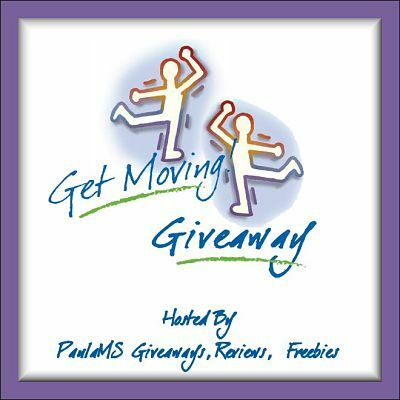 Giveaway runs through September 6th. Good luck. 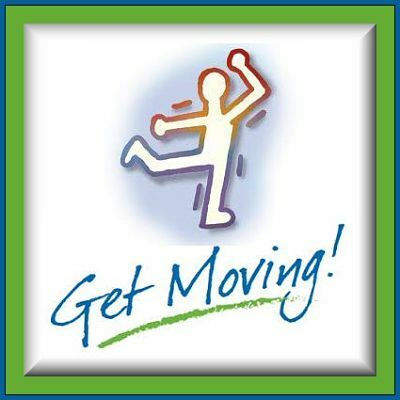 Great for stretching and strengthening muscles for Yoga, Pilates, Cross fit, P90X or general fitness. Complete set includes 5 exercise bands of increasing resistance, 2 foam padded handles, 1 door anchor, 1 ankle strap, and 1 guidebook. I used resistance bands as part of therapy at the rehab center when I shattered my wrist and these are just as good as the high quality bands that they had me using. The handles and straps that are included make it a perfect set for home workouts and strength building. I really appreciate the nice bag to keep everything together and ready to pack when traveling for work. Aurorae Fitness has made it easy enough to pack that you would be hard pressed to come up with an excuse not to take it with you and keep up your routine when you are away from home. Compatible with most cellphone and devices with bluetooth capabilities.High quality soud with HD speaker and enhanced BASS effect. 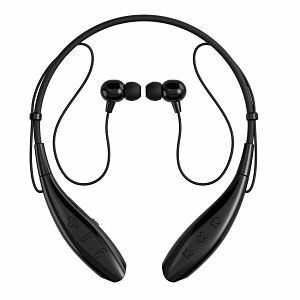 Comfortable,flexible and light neckband made of ultra-light shape memory alloy. Easy to handle ear set with magnetic properties. Music play time: Up to 8 Hrs. Charging time: <2.0Hrs. Operation temperature: -10℃ to +60℃. Size: 17cm x 14cm - 6.69inch x 5.51inch. I found these very easy to sync with my phone and table and comfortable to wear. Phone calls were clear and easy to hear. Loving to listen to music while working out to help motivate me the sound of the music from this set was important. I found the quality of the music from the headset to be impressive. I have given previous sets to my boyfriend but this set will be mine. I would highly recommend this Soundpeats Headset to anyone looking for a quality wireless headset to communicate and listen to music while being active. DESIGNED TO FIT MOUNTAIN, ROAD AND HYBRID BIKES. Attaches Under the Seat or Below the Handle Bars. Straps Fit Securely Around Top Tube that is Up to 6" in Circumference, Down and Seat Tubes that are Up to 7" in Circumference. Refer to Sizing Chart in the Picture on the Bottom Left to Ensure the Bag Fits Your Bike. LARGE ENOUGH TO CARRY EVERYTHING YOU NEED FOR A DAY TRIP. Two Expandable Storage Compartments Easily Fit Basic Tools, Tire, Chain, Shirt or Light Jacket, Snacks, Keys, Wallet and Cell Phone. 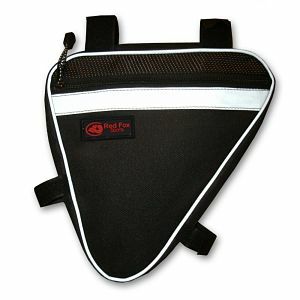 This bag from Red Fox Sports is made from a nice heavy canvas and is well stitched. With the four straps you can put it in the front or back of the frame. I put this bag on her beach cruiser for my Mom in just a few seconds. Mom likes it in the front on the frame just behind the handlebars and it was nice that I could put it were she wanted it. With this bag she has someplace that she can put items that she needs to keep with her. It is essential that she keep her emergency diabetic kit close by at all times and it fit perfectly in the bag. There was even room for her credit card holder, keys, and a few other small items. She is very happy with her new bag. FIGHTS LEG AND FOOT FATIGUE - Graduated compression design increases pressure gradually helping blood to recirculate to the heart. You'll be able to power through the most grueling workouts or intense game play with less muscle soreness and heaviness in these athletic compression socks. FEWER BLISTERS AND INJURIES - Selective cushioning absorbs shocks with your movements, reducing strain on the legs and joints. The padding also limits sliding in your footwear to decrease the risk of painful blisters. DRIER, HEALTHIER FEET - Unique moisture-wicking fabric draws sweat away from the skin. Drier feet means less risk of foot odor and infections like athlete's foot. STRONG AND COMFORTABLE - Reinforced stitching in the toe and heel helps our compression socks stand up to frequent laundering. The large toe box gives you plenty of room to ensure comfort with every step. FITS YOUR FEET AND YOUR SENSE OF STYLE - Available in Men's and Women's sizes. I got a size medium for my boyfriend who wears a size 10 shoe and they fit perfectly. 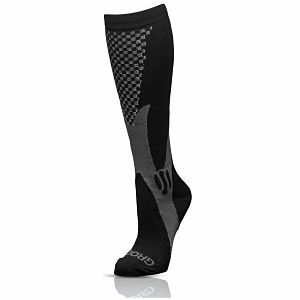 He has wanted a pair of compression socks to wear while doing his twenty mile bike rides for a while now. When they arrived he wore them around the house and they felt so good he thought about wearing them to bed. The first day he wore these from Groove Socks on his ride he was thrilled with their performance. He has also wore them on his runs and has found that they help prevent some of the pain from his shin splints. Because I wash his workout clothes by hand after each use I have had the opportunity to check the stitching and material of these socks out very closely. I am very happy with the quality of these socks. I have found that they are very well made. 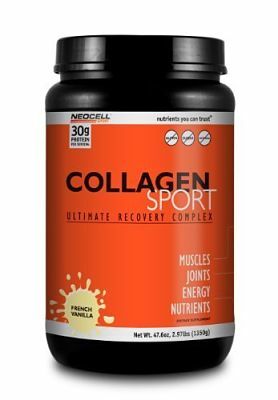 NeoCell has been developing and manufacturing all natural, premium anti-aging formulas for over 20 years and is the leading collagen brand in the world. Their products are naturally based, not synthetic, and are designed to promote youthful health, beauty and total body wellness. They manufacture their our own products using carefully sourced food-grade raw materials and their facility exceeds all GMP standards. They strive to continuously bring the best products to their customers. Products that are made with Nutrients You Can Trust®. This is a great recovery product since it meets so many of your needs post workout. Whey protein isolate which this product contains is the preferred and best form of whey for recovery. Collagen sport also is a good source of daily vitamins and minerals. You can feel a difference in your recovery time as well as a lower incidence in fatigue when you start taking the Neocell Sport regularly. Just add a scoop or two to milk or water and mix well. I put mine in almond milk with some peanut butter powder, too. For Secret Word Page 3 i put the wrong word,it should be Giveaway instead of New.